There’s always a chance! Are there any particular issues you’d like to highlight? Thank you all very much for the subtle improvements. To polish the desktop environment is more important than to introduce new feature as far as non-geek end-users are concerned as long as the DE is for daily use in stead of being a toy. I strongly agree, which is why I proposed and lead the Usability and Productivity initiative! I would like to see some improvements in System Settings (especially the kwin kcm’s cause they are very technical but in general kwin is that much powerfull also default users could be interested into use the kcm’s. I echo that sentiment… the “Display and Monitor” -> Compositor is not very descriptive to someone coming from a different OS and who needs to troubleshoot their machine, which was my case. Where it says, “Rendering backend”, the option says “OpenGL 3.1”, “OpenGL 2.0”, and “Xrender”. Those are meaningless technological terms for most people, or even for experts from other machines! So if they said something like, “Latest drivers (OpenGL 3.1)”, “Default drivers (OpenGL 2.0)”, and “Compatibility drivers (Xrender)”, that would make more sense. Because otherwise, the poor user is going to feel afraid to change the setting or have to resort to some deep Googling to find out. In the Displays module, it would be more clear if the mouse cursor changed to the double-arrows cursor when hovering over the monitor to signal that it can be repositioned. I’ve had to tell people that otherwise they wouldn’t know that they can move the monitors around. How is AppStream support going? Do you expect it to work when Ubuntu 18.04 is released? 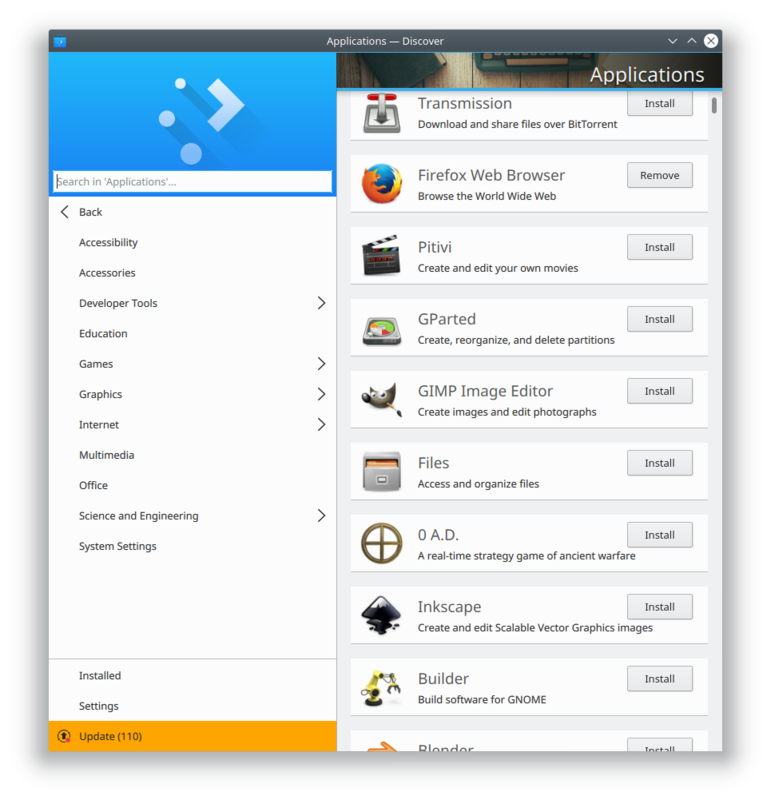 KDE Neon would be based on 18.04 by then, will we finally see AppStream support? I just checked out Discover today and the progress is amazing. How about having Featured apps section? Editor’s Pick? Most downloaded? Highest rated? How is AppStream support going? Initial support has landed for snap, but it needs more work to allow all the various layers of snappy to use it. In other words, the work is all on Canonical’s side. I’m not sure if they’ll have it ready for 18.04 (but I hope so). How about having Featured apps section? Editor’s Pick? Most downloaded? Highest rated? I’d submitted what was a dupe of the Firefox tab issue and am so glad to see this has been implemented! Thanks!